The Mike Benign Compulsion: Short video: album cover shoot for "Here's How It Works"
Short video: album cover shoot for "Here's How It Works"
Back in November, Joe Pabst graciously agreed to be the cover model for The Compulsion's forthcoming full-length record album, "Here's How It Works." So Ken Hanson—designer, photographer, bass player, Chief Dude Officer at Hanson Dodge Creative and all-around good human—put together a photo shoot to capture images for the cover and sleeve. The short video below delivers not only a peek behind the curtain at the photo shoot, but also the first look at the cover for "Here's How It Works," which will be formally released at our Saturday, March 8th album release party at Shank Hall (with special guests the fabulous Testa Rosa). The video also features a snippet from the song "Boyhood Idol," which you'll find in the number eight position on HHIW. We can't thank Ken and Joe enough for their contributions to the new album. Ken has been particularly amazing, handling art direction and design as well as all of the photography—not to mention creating a slew of great gig posters for the band. So thanks, Ken and Joe. Melodic, well-crafted, driving alt guitar pop that rocks. Band members Mike Benign, Joe Vent, Paul Biemann and Mike Koch are veterans of acclaimed Milwaukee-based acts like Blue in The Face, The Yell Leaders, Arms & Legs & Feet and The Joker’s Henchmen. Live shows include opener slots for Squeeze, Neil Finn (Crowded House), The Lemonheads, The Alarm, Bob Mould, Black Francis, Rhett Miller, Marshall Crenshaw and others. 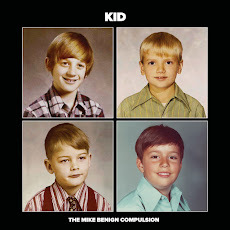 In 2014, The Mike Benign Compulsion released “Here’s How It Works,” the band’s third album. The Shepherd-Express called it “a magnificent tribute to the smart pop of Benign’s era—The Beatles as distilled through Squeeze and Crowded House with a twist of Elvis Costello for tartness.” The band’s fourth album, “Kid,” arrived in May of 2017. We send out an email update on a monthly basis. Go here to get in. Absolute Power Pop Review of "Kid"
Power Popaholic review of "Kid"
Broken Hearted Toy Review of "Kid"
Milwaukee Journal Sentinel review of "Here's How It Works"